Supernatural bounty hunter John Tower returns in this thrilling new saga from writer Matt Wagner (Mage, Grendel) and artist Simon Bisley (Lobo). For untold ages, Tower has spent his life eradicating the evil that lurks within the shadows of our world. Battling creatures and criminals of every shape and size, his true goals have remained a mystery… until now. Tower’s obsession to break free from a centuries-old curse has all but consumed him - but he must tread carefully when his unofficial partner, FBI agent Alicia Hardwicke, begins to dig deeper into his past. What does Tower have to hide - and what will happen when the truth is exposed? 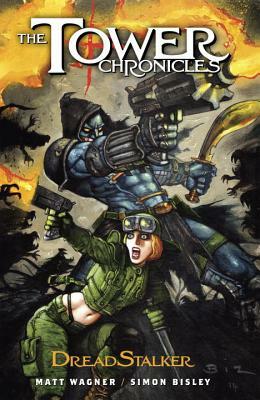 An original supernatural action/adventure, The Tower Chronicles: DreadStalkerstands as the highly-anticipated sequel to The Tower Chronicles: GeistHawk.